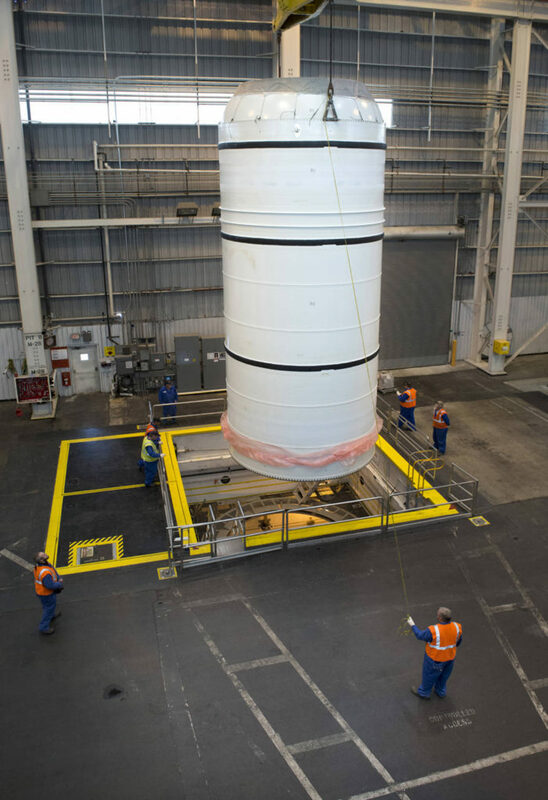 April 25, 2016 – The first of 10 flight segments for the two solid-rocket boosters of NASA’s Space Launch System has been cast at Orbital ATK’s facility in Promontory, Utah. Casting involves filling the insulated metal case with propellant and allowing it to solidify or “cure” for several days. The hardware, which is the aft segment, will eventually be integrated with four other segments to make up one of the two, five-segment solid rocket boosters for the first flight of SLS in 2018. 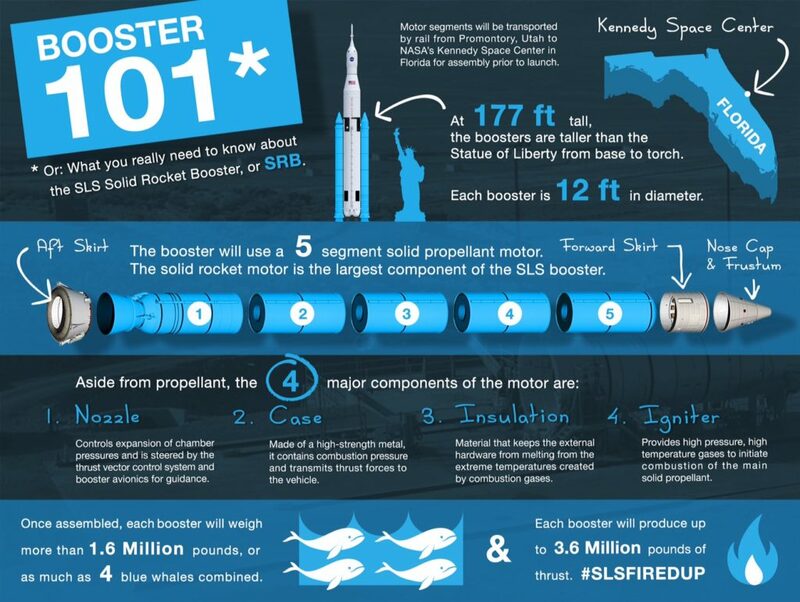 The SLS booster is the largest, most powerful solid propellant booster ever built. Standing 17 stories tall and burning approximately six tons of propellant every second, each booster generates more thrust than 11 four-engine jumbo commercial airliners. Together, SLS’ twin boosters provide more than 75 percent of the total SLS thrust at launch. The major physical difference between the Shuttle and SLS boosters is the addition of a fifth propellant segment to the four-segment Shuttle booster, allowing NASA’s new launcher to lift more weight than the Shuttle. 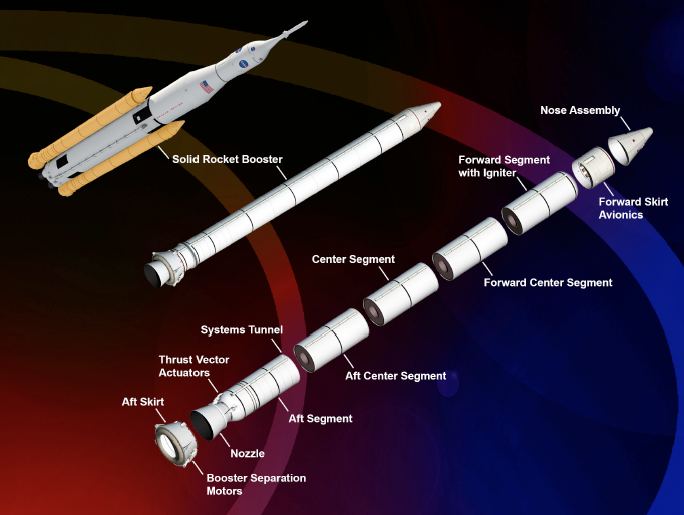 Additionally, the SLS booster will be optimized for a single use, while the Shuttle booster was designed to be reused. Though based on the Shuttle booster, the SLS booster benefits from several design, process, and testing improvements for greater performance, safety, and affordability. Each booster is mated to the SLS Core Stage by braces on the forward and aft booster segments. On the launch pad, the booster carries the entire weight of the fueled SLS launch vehicle. After launch, the boosters operate for about two minutes before separating from the Core Stage. During the first flight of SLS, known as Exploration Mission-1, SLS will carry an uncrewed Orion spacecraft to travel thousands of miles beyond the moon over the course of about a three-week mission and help NASA prepare for missions to deep space, including Mars. Orbital ATK is the prime contractor for the boosters. Lockheed Martin of Littleton, Colorado is the prime contractor for the Orion spacecraft.